With just a brief pause to catch breaths, and restore page marks, Seanchai Library moves into November as the “storied” season continues. “What do you mean by ‘storied’ season?” “October was one of our biggest months,” shared Chief Storyteller Shandon Loring. The November line up promises plenty of stories to engage a wide variety of literature lovers, plus a special announcement. ** Sundays: The popular Tea Time session will culminate on November 8th when the Seanchai staff completes their first circuit of the entire canon of original Sherlock Holmes literature with the conclusion of Sir Arthur Conan Doyle’s novel The Valley of Fear. ** Tuesdays: Features a team of Kayden Oconnell, Trolley Trollop, and Caledonia Skytower presenting selections from contemporary humorist bailey White’s Mama Makes Up Her Mind. ** Wednesdays: Faerie Maven-Pralou explores the short stories of one of the 20th Century’s great storytellers, Roald Dahl. ** Thurdays: Chief Storyteller Shandon Loring presents a wide variety of myths, legends, and adventures. This month will include American Noir and his annual presentation of Alice’s Restaurant Massacree. Specific session listings can be found on the Calendar tab of Seanchai’s website. 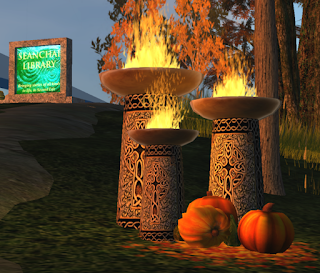 Seanchai also announced that they will bring back the popular festival, first presented in 2012 to th anniversary of author Charles Dickens’ birth, is returning to Second Life this December in a limited form, to benefit The Community Virtual Library. The festival is presented free to all Second Life Residents, and donations will be accepted for the Community Virtual Library: a registered 501(c)(3) non-profit organization, connecting residents with information resources, reference services, and serving as a networking tool for information resource professionals. The nine day festival will open on December 12th centering on Dickens’ A Christmas Carol, presenting the novella in a variety of adaptations, in sections and in its entirety. The work is presented at different times to make the live readings accessible to residents from different parts of the globe. Other works from within the author’s vast canon are featured, and interactive information on the times and work of Charles Dickens can be explored. 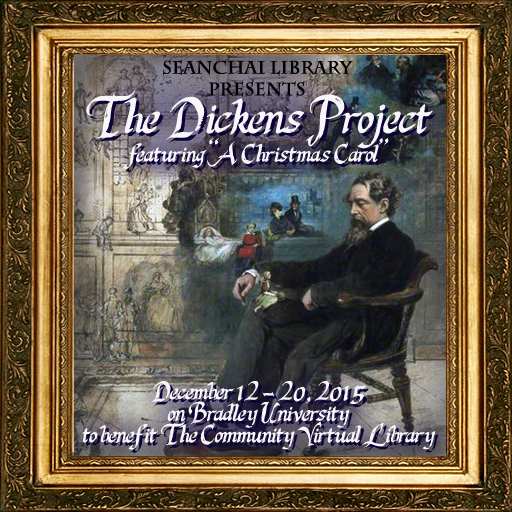 Seanchai Library will produce the 2015 edition of The Dickens Project, presenting nearly fifteen hours of live readings between December 12 and 20th, and holding a dance and music event “Fezziwig’s Ball” on Saturday, December 19th. The final event, a marathon “All Read” presentation of A Christmas Carol performed by a relay team of Seanchai staff, is tentatively scheduled for Sunday, December 20th. 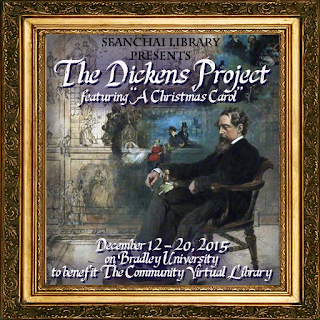 The final event schedule for The Dickens Project will be released in early December. One of the oldest spoken word venues in Second Life, Seanchai presents literature and stories live in voice. “Our ‘collection,’ as libraries typically call the resources that they make available to the community, is built one session at a time, one story at a time shared live in voice. Seanchai Library regularly presents five to eight hours of live programming weekly from their home in The Community Virtual Library on the Bradley University sim.